Tossed and Found on North Monroe. The once bustling Monroe Street in north Spokane is surprisingly quiet for a Wednesday afternoon. Only the beeping of machinery pierces the silence as workers smooth out gravel in the barren street. Orange traffic cones litter the area where segments of sidewalk once were. Regardless of the work outside, a red neon sign at Tossed and Found flashes in defiance: O-P-E-N. The antique store is one of around 80 businesses affected by construction on North Monroe, from Indiana Avenue to Kiernan Avenue. Many offer great options if you're looking to add to your home decor, like Marilyn's on Monroe, the Boulevard Mercantile, 1889 Salvage Company and more. Leslie Fleischmann, one of Tossed and Found's owners, says that business is down by about one-third since the construction began and walk-in traffic has decreased. But she says, "We have very loyal customers, so they're still coming here." 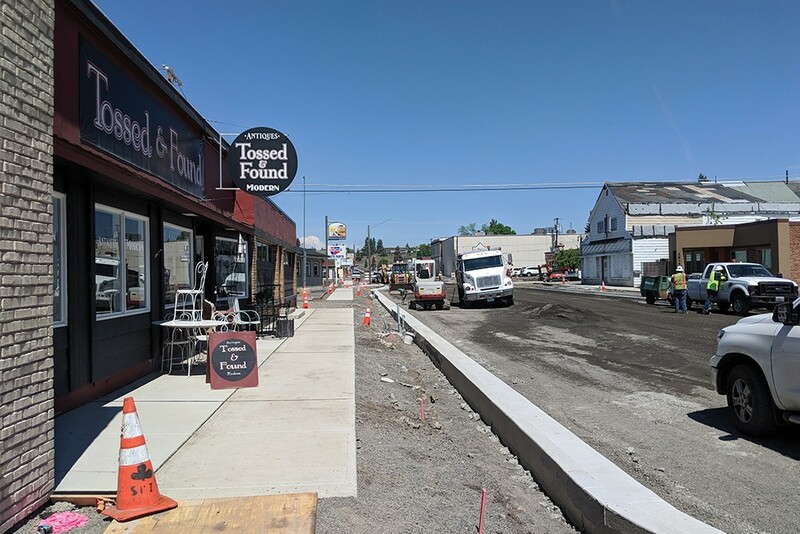 The city of Spokane hopes North Monroe will be a vibrant district when the project is complete, more friendly to pedestrians and shoppers, with reduced traffic lanes, widened sidewalks and additional on-street parking and lighting. Temporary signage on Post Street directs customers to the correct cross streets for accessing Monroe Street businesses. Except for brief periods during which sidewalk construction may obstruct an entrance, businesses are still open during construction. In general, "Businesses are thriving," says Fleischmann, "but some could use some extra help." To learn more about visiting North Monroe this year, check out monroeproject.com.